I will, sadly, admit that our bedroom is the last to get decorated. I think we had maybe one thing on the wall in our place in Gunnison. We had a window above our bed there, so we never had to get creative with a headboard or decoration. Way back in 2010...last January to be exact...I did some repurposing to an old vintage cupboard we had. I took one of the doors (while chase made the remainder into a bookshelf) and made it into a chalkboard for my studio. You can see the whole project here. Because I made the large embroidery hoop for the guest bedroom and there was not a lot of wall space for this guy in my new studio...I decided to put it above our bed. Bonus: it matches the side tables that Chase made! 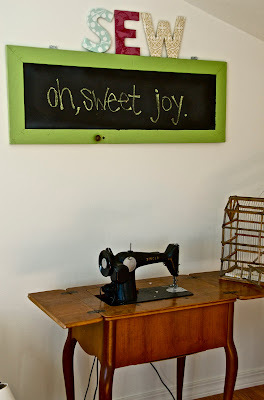 What repurposing/redecorating have you done lately? ps have you seen this?!?! I'm totally getting it for craft shows & such for oh, sweet joy! Brilliant. BRILLIANT! I love my iphone. Our living room and dining room look super cute, but our bedroom is still sad. We ran out of decorating budget and now I really wish we could spruce it up. I love that idea. We've never decorated our bedroom, because we've been planning to move out of state. I think I'll remember this idea though! My future phone is my favorite thing, too! 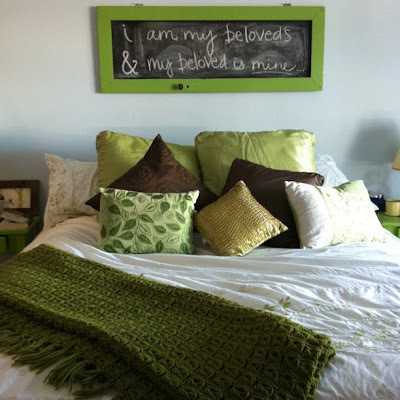 And the chalkboard above your bed is just dreamy! that chalkboard is great! 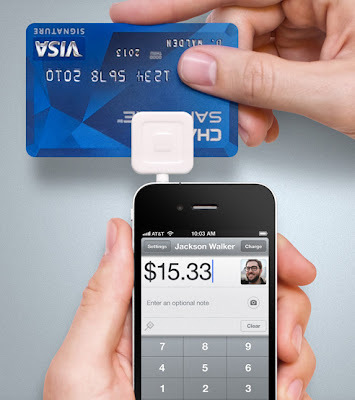 and how handy is the square - I'm going to have to look into that ASAP. Love the bedroom! I love how the green is in the chalkboard and the side tables! I'm going to be doing some (my first) DIY projects this spring! I might have to check out that chalkboard project! Hey I just ordered a Square for my phone today!!! I'm in two craft fairs and I almost signed up with Propal (which has an annual fee) but then I was directed to The Square. So happy I found it! so does the square work with the new iphone 4 because I know they had one for the old iphone but not one yet for the new one? that will be exciting if it is! We both posted about things above our beds today. Weird. ok first of all, awesome job on that chalkboard, it looks great. i still need something to put above our bed. i LOVE that you wrote that song of solomon verse on there. so perfect. and i so wish i had an iphone!! i didn't know about that gadget until i did my first craft fair in december and a TON of people had it!! so nifty! and nope, haven't seen that credit card swiper. impressive. sad, i dont have an iphone. i LOVE the chalkboard and all the fun pillows!! i've seen ppl use that for craft shows before, it's soo cool! i think it can email the buyers a receipt too!! Aww I love the chalkboards! They're such a good idea and I love how they go with the colors in your room! That app is SO amazing! hiya friend! i know this isn't today's post but i just stopped by to tell you happy valentine's day! i hope its wonderful! and i love your bedroom decor! so fun! My friend uses square for her business. She said it was perfect for their craft shows and a must have. I will likely be getting it myself. 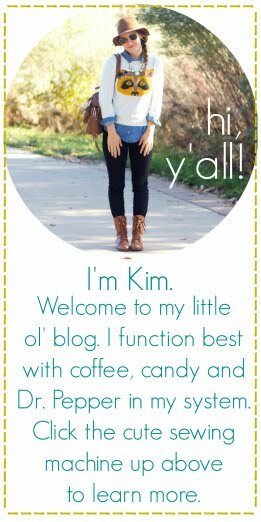 i'm not sure how i got here, but i just fell in love with your blog!! so cute! i just saw your sewing space! what a good idea. so clean and organized! i just cleaned mine. it was a super disaster! i'm off to peek around your shop!